As our Challenge is based in America and it's Mother's Day over there our theme this fortnight is Mother's Day/Spring. We were given some very beautiful images from Prairie Fairy to use. I received In a Nutshell to use and I loved this image so much I coloured in 4 of the images so I can use them at a later date. 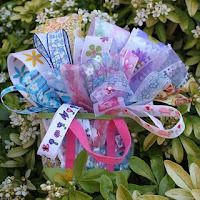 As a bonus we will also be sponsored by Crafty Ribbons. We are also having a Guest Designer this challenge. Hop over to the Challenge blog to see Bridget's gorgeous work. 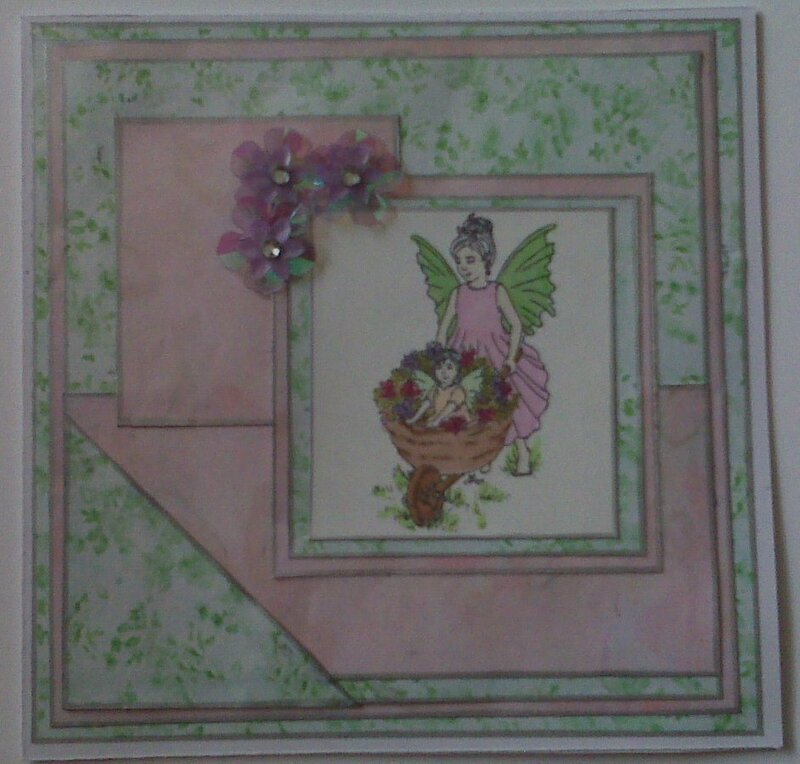 For my card I used Prairie Fairy 'In a Nut Shell' with backing papers from a CC flower fairy CD and flowers from stash, all edges highlighted by a Sakura Silver Calligraphy pen. I had a nightmare with this card as I couldn't find my double sided tape or tape pen so had to use a glue pen which wouldn't stick. I about to get out the flour and water when I found some wide double sided tape. I eased the layers off, of which there are plenty, and stuck them down again with the tape. I also realised I had printed my image slightly too big for my mats and I wasn't feeling too great I couldn't be bothered to print it again. By this time the light was fading, hence the rubbish picture. Now hop over to the Creative Cowgirls Challenge and join in. Unrestricted Challenges is a blog page where Susan from Susan's Crafty Chaos has listed loads of challenges. It is the one I refer to when choosing my challenges. THANK YOU Susan. Gorgeous work, I love all the layers. Thanks for joining us at CCC. Hiya. What a stunning card this is. Beautiful image, so peaceful and serene. Beautiful papers and fab design. Happy crafting. I love your card, it's beautiful! Fabulous coloring & I love all the layers! Good Luck on your Challenges. Beautiful card! such pretty papers! Hi Poppet, this is such a pretty card! 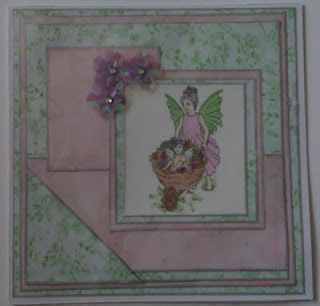 Great card and love seeing the Prairie Fairy images, thanks for joining the Diva's at Do it with Digi's! Such a beautiful card! Lovely design and coloring!